cheapest these have been for a while. I dont know why this is cold. This is the cheapest they have been for a long time and its the new version of the bulb. I have these and they are very reliable. Great price and great functionality so heat added! I have tried a multitude of smart bulbs (except hue) and these are definitely the best i regards to power and reliability. They are expensive though. I paid £59.99 each for them friday, for the b22 ones only got them yesterday yet amazon says then cant refund the difference and she told me they dont have the ability? told me i would have to send them all back and reorder, what a waste of resources! and inconvience to me. I cant see why they dont do it, only had them a day and saves them money in the end. oh well guess back off they go. To be honest i got them cause i bought the echo, the novelty soon wore of after one day lol and time the echo responds which is a slight delay, it would of been quicker to switch light on myself. Ebay 10% quidco and Argos ebay has them at the same price. I reserved one last night to use as a sunrise alarm. I paid £59.99 each for them friday, for the b22 ones only got them …I paid £59.99 each for them friday, for the b22 ones only got them yesterday yet amazon says then cant refund the difference and she told me they dont have the ability?told me i would have to send them all back and reorder, what a waste of resources! and inconvience to me.I cant see why they dont do it, only had them a day and saves them money in the end. oh well guess back off they go. Was that on the live chat or on the phone? I had a similar problem earlier in the week, live chat said they couldn't do it but on phone they didn't argue at all just done it. ​Maybe I want to control my lights when I am away from home? Maybe I want to turn my lights on with voice control? Maybe I want my lights to come on when my CCTV detects motion? Maybe I want a range of colours instead of just white? And that's just a few things the quid bulbs don't do. 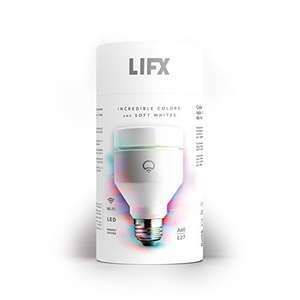 Added heat for the reduced price it's still way overpriced but I do prefer lifx's colours and app/colour control over hue and yeelights. ​Maybe I want to control my lights when I am away from home? Maybe I want t …​Maybe I want to control my lights when I am away from home? Maybe I want to turn my lights on with voice control? Maybe I want my lights to come on when my CCTV detects motion? Maybe I want a range of colours instead of just white? And that's just a few things the quid bulbs don't do.